The OCR Plugin performs Optical Character Recognition (OCR) on behalf of other applications. It provides the possibility to capture text from printed books and newspapers by pointing the rear camera of your device. The OCR plugin requires a back camera with autofocus to perform proper OCR functionality. It also requires updated Google Play services. Please download this plugin only if you have an application that requires it. These applications may use OCR plugin to capture text via camera. 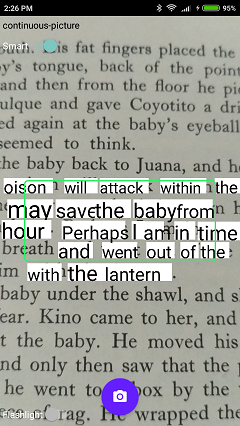 The OCR Plugin has to be used together with an application that supports it, e.g. 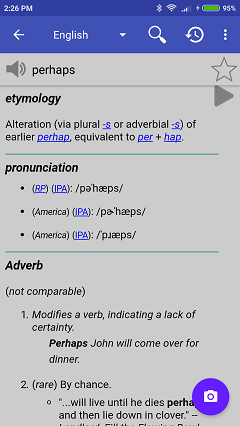 the Online Dictionary by Livio, at least version 3.5 is required to run OCR plugin. You shall enable the OCR Plugin in the target application, i.e. activate the camera search in the Dictionary application settings: please select Settings-->click on Floating Action Button-->select Camera. After you have enabled the OCR Plugin in the target application, look for the small camera icon in the target application and press it. The OCR plugin is started by pressing the small camera icon. Please point your device camera towards a printed text, e.g. a book or a newspaper, to focus some text. Text recognition is performed in the central area surrounded by the green rectangle. Text that is recognized is shown in small white rectangles, you can select a word by tapping on a white rectangle. 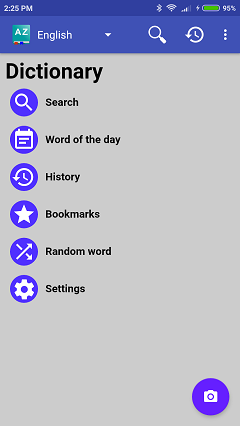 Once the text has been selected, the dictionary application will show the definition.